In the future there will be more ‘adapters’ to make the barrel more versatile in terms of plant size and medium used. One missing part is the one providing just 1 centered 2-inch net pot. 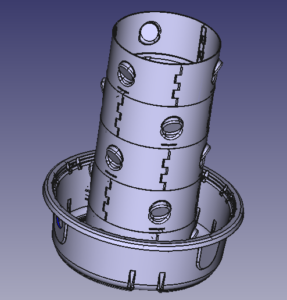 It will make the spacing very variable using the closed parts and the parts with two 2-inch net pot inserts interchangeably to assemble your ring segments. 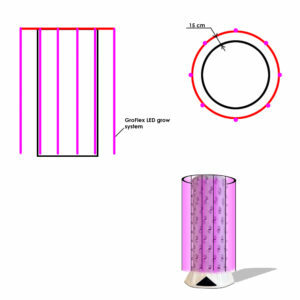 Illustration of a vertical barrel surrounded by flexible led ribbons. Because of the shape and nature of one or more vertical cylinders/barrels of variable height, adding radiation to setups is tricky. 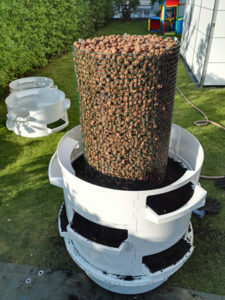 One solution would be just surround the barrel surface with your plants with flexible LED ribbons like they are used in shipping containers using ZipGrow towers. If you are operating in a greenhouse and you are in a location with enough radiation, diffusing glaring will do the trick. But not everybody has a nice greenhouse at hand. Rotation base construction using the top lid as base. This is why we will come up with a rotation solution for the vertical barrels. The construction is already done and looks like in the construction on the right. 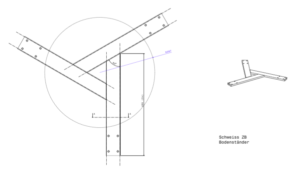 There are 2 rotational ‘propellers’ using a gliding disc. We can use the top lid as base just like in the hanging version of the vertical barrel. On longer production lines there might be a need to elevate the barrels in order to catch the liquid draining in the middle with enough slope for the gravity based circulation. Once we can rotate the barrels, we can use the standard lights again. Using the closed base in substrate based barrel setups or for soilless standalone vertical barrels is much more fun if you can also move these heavy objects around. 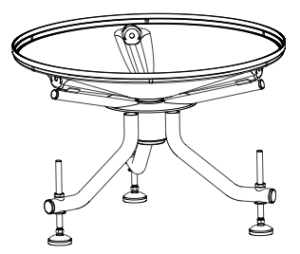 For this purpose the closed base already has kind an area integrated that will hold on to a triangle metal base. Currently we only offer the construction for users so they can weld them locally themselves. See PDF on the manual page. The plan is to get this piece also in series and offer it for people who do not want to weld themselves and equip the thing with 3 heavy weight rolls. This will also make the filled and planted soil based barrels be transportable by a forklift. Which might be very useful if you like to handle many of them. Inside stainless wire mesh built with zip ties and filled with hydroton. We often hear that the amount of substrate required to fill a vertical substrate based barrel is too much. True, that is why we always put a wire mesh inside and used it as draining column. The substrate/compost is the only filled into the space between the column and the shelves. In order to make things more versatile and professional to set up, there will be another lego-part to assemble the inside. Using 3 pieces in that case to assemble a ring segment. The closed base already has a line engraved that will keep the inside column in place. 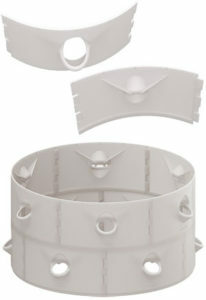 With this piece you can grow your inside column with the usual ring segments. Inside column to save substrate and have less weight. The 1/3 ring segment parts are closed as default but can be drilled if required in the flat area. You can leave the inside completely empty or fill it with hydroton or whatever you like. You could also use it for your own irrigation solution or whatever you like.